Todd Jacobsen from Bend, Oregon caught this bright 45-pound Chinook while pulling an un-wrapped K-15 KwikFish on the Chetco River last week. Photo courtesy of Todd Jacobsen. The groundfish and lingcod fishery has been completely closed in the entire state of Oregon for almost 4 months, and anglers are jonesing for a rockfish fix. So get out your calendars and sharpies because it's time to start counting backward. In precisely 23 days, Oregon salty dogs will be able to fish for rockfish, cabezon and lingcod when the new season opens on January 1. In an extremely-long Oregon Fish and Wildlife Commission meeting held on December 8, the commission finally said to the 160-plus crowd, "We've heard enough public testimony. We have to get this issue settled!" When all the Tees were crossed, the commission finally voted for ODFW's option 'C', which called for a 5-fish marine fish bag limit for the entire year. ODFW will then possibly adjust the fishery mid-season in order to avoid another dreaded closure. It is important to note that Oregon defines a marine fish bag limit to include rockfish, greenling and when in season, cabezon. Only one cabezon may be included in the daily marine fish bag limit. Cabezon can only be caught by sportfishermen during July 1 through December 31. Lingcod are not included in the 5-fish marine fish bag limit. For example in addition to 5 rockfish, an angler may also keep 2 lingcod (minimum size 22 inches), which makes for a 7-fish daily bag limit - not too shabby! Even the commission was slightly confused as to what was exactly meant by a 5-marine fish bag limit. This term was not sufficiently explained in the Agenda Summary. At one point in the meeting, one of the commission members had to ask ODFW which fish were included in the marine fish bag limit. This was one of the most highly-heated and controversial meetings I ever witnessed. 35 people had signed up to testify but only 30 persons ended up on the firing line. Due to a highly-limited time span, the commission only gave each person 2 minutes to sum up their testimony. People were brought in front of the commission in groups of 4. In combination of ODFW's deliberation, public testimony and commission action, the meeting on the groundfish aspect of the meeting totaled well over 3 hours. Since the closure in September, Oregon anglers have towed their boats across the California border in order to fish for their bottomfish and lingosaurs, as well as Dungeness crab. The entire southern Oregon coastline from the north jetty of the Coquille River south to the Oregon/California border, including all of the inclusive bays have been closed due to high levels of domoic acid toxin. Although the fishing can be quite good out of Del Norte Harbor in Crescent City, anglers have talked about the lack of fish habitat, and having to hammer one or two of the more popular rockfish areas. Brookings Harbor on the other hand has very reefy water. As soon as you exit the jaws, you encounter your first reef. There are so many high spots that it is literally impossible to name them all. So for a good Christmas present to yourself, make sure that you purchase a new 2018 fishing license. You don't need to buy a tag to go with the license, that is unless you are fishing for salmon or steelhead in local-area rivers such as the Chetco. December is also the time of the year when river fishing is in a transition period. Just think of the salmon and steelhead runs as the beginning and end of a bell curve. Ever wondered why the term is called a bell curve? Just looking at the sides of a bell will give the term away. Just imagine drawing a bell as a graph on a piece of paper. The flattened out sides of the bell are examples of low numbers of fish, while the steeper, climbing sides represent an increased number of fish. The very top of the bell is when steelhead numbers are at their peak. So when a salmon run is nearing the end of its cycle, as in the case of the Chetco River, the tail end of a bell curve becomes flattened out, as is the case of December. There are still a few fish entering the system, but their numbers are diminished. But steelhead usually follow hard on the heels of a salmon, picking up eggs drifting off of their redds, one at a time, as fast as they can. So if you draw a graph of a steelhead run, the very beginning of the steelhead run will have a flattened-out appearance, where not many steelhead will be showing up in large numbers. But as the rainy season coincides with the Christmas holiday, winter steelhead will begin showing up in catchable numbers, and it becomes quite easy to visualize these increased numbers as the bell climbs and steepens. And because they come in hard on the heels of the end of a salmon run, it is best to drift-fish single Lil' Corkies, Puff Balls, Fish Pills or just a tiny bit of roe because you want your lures to represent their food source. Life imitates nature and all that stuff. That being said, there are still salmon being caught on the Chetco. Although the run may be flattened out like the end of a bell, the ones that people have been catching have been Toad-zillas! 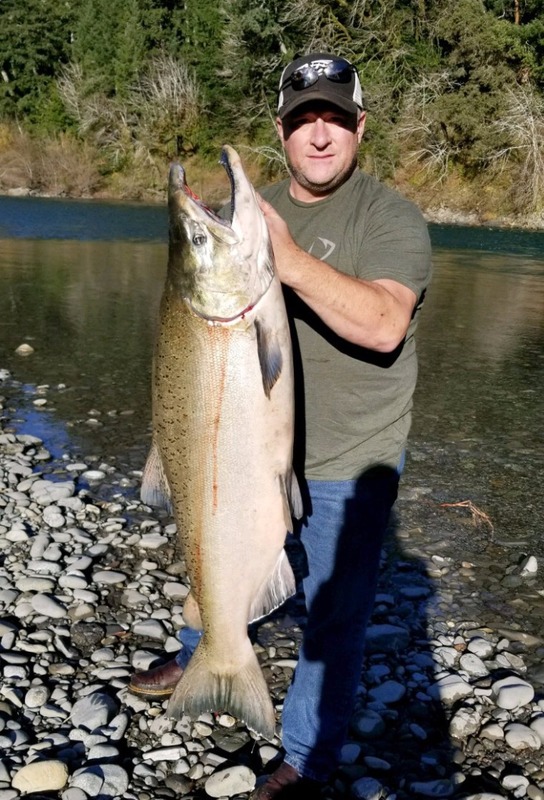 Like the 45-plus pound chrome-bright Chinook that was caught by Todd Jacobsen on December 6 when the Chetco was flowing at 1,900 cubic feet per second. That was just enough current for Todd to catch his big king on a K-15 double trouble KwikFish. When the Chetco drops toward 1,600 cfs as it did last week, the river becomes gin clear. That's the time to work your plugs at the crack of dawn for that 2-hour window of opportunity. With lack of rain in the immediate forecast, the Chetco is predicted to drop toward 1,200 cfs or even lower toward the middle of next week. 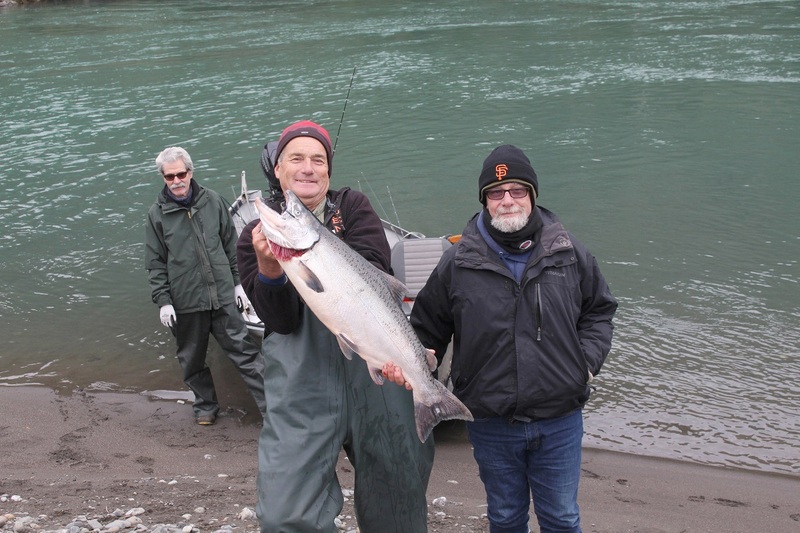 But with rain predicted later in the week, that just might spark a few chrome metalheads to enter the Chetco, and by the New Year, it should be peak season for the silver missiles. Ding - ding!